When you enter this apartment a wonderful open plan renovation invites you in as the area flows over shiny gloss floor tiles from the entrance through the kitchen and living room all the way to the bedroom, which is separated from the living room by huge frosted glass sliding doors and windows. This provides ample natural light throughout the apartment whilst still providing complete privacy in the bedroom. The kitchen features fridge / freezer combination, electrical oven and stove with extractor fan, washing machine, microwave oven, kettle and toaster. The dining area has a glass top four-seater dining table and designer chairs. The living room has a comfortable two-seater couch and cool blue persian carpet which blends in beautifully with the rest of the decor and wall paper behind the headboard of the bedroom. This makes the entire apartment appear very attractive and inviting. The living room has a TV, DSTV (Satellite) and DVD player. The two stunning round ottomans complete the decor , and ideal to put your feet up after a long day. 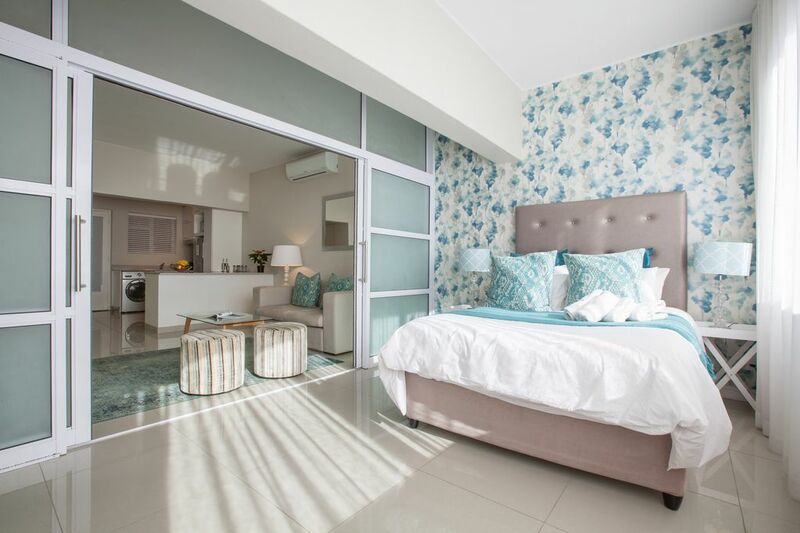 The bedroom is decorated in cool ocean colours and has windows from side to side allowing much natural light into the apartment. The modern bathroom has a shower, hand wash basin and toilet. This part of Green Point is extremely central from where you can easily take a stroll down to the V&A Waterfront or the trendy Cape Quarter with its many art and decor shops together with restaurants, cafes, bars and nightlife. Designer renovated 1 bedroom apartment in traditional Green Point building in quiet residential area. Great location close to amenities which offers lock-up garage. There is a double sleeper couch in the lounge, suitable for 2 kids under 12 years old. Only! My wife and I arrived at the property with a bit of apprehension since the building is an older one on a narrow, twisty side-street and we weren't sure of what we'd find. But #3 is a totally modernized unit that cleverly makes use of all the space using bright, modern finishes and decor. The price is right and it's located within a few blocks of central Green Point so it's an easy walk. And another 6 blocks or so away is the V&A waterfront. If you have a car, there's a garage which gets you parked securely off the street at night. With the room darkening shades and the reverse cycle air/heat unit, it's totally quiet, cool and dark at night so peaceful sleep is no problem. The property was very clean and nicely appointed, all in good working order. Jacqui and colleagues looked after the few requests we did have and two of the recommendations we left behind were to install WiFi in the unit and to upgrade the DSTV package to include movies and sports channels. Otherwise, we look forward to another stay there before too long.